Pattern’s an easy theme for most I think this week, so I went for something a little different: These paisley pattern joggers are now the first item of paisley print anything I own! In what I hope is going to be one of the last few truly wintry outfits of this year, I’ve gone for a very rich palette of burgundy, black and grey – with a little hit of warm tones in the form of a camel fedora and taupe block heel loafers (LOVE this shape shoe – they’re so flattering and pretty comfortable thanks to the heel). You might be amazed to know that this whole outfit (including shoes but excluding accessories) comes to a total of £66: Top marks, George at Asda! 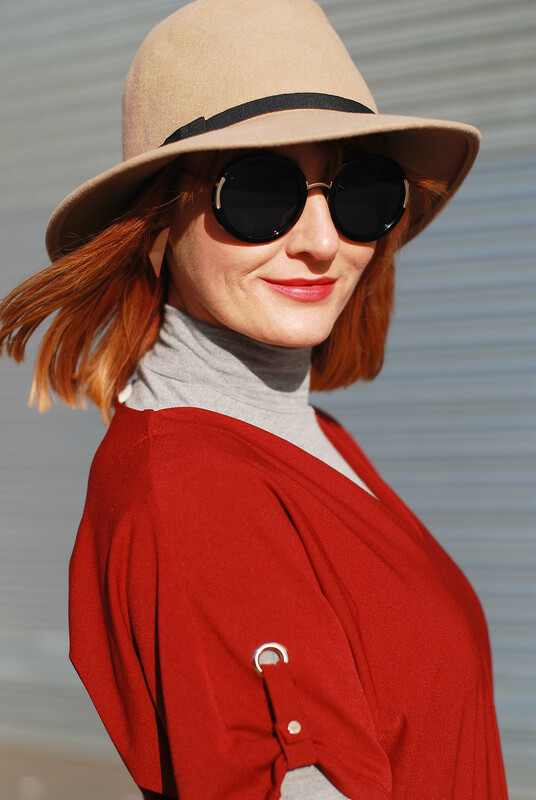 I’ve been into my roll necks a lot this past winter, and I do like a roll neck layered under dresses or other tops like this burgundy asymmetrical tunic. The grey and burgundy look soooo nice together – I know they’re very autumnal colours and we’re approaching spring, but when it’s freezing outside it still makes sense. I’VE BEEN INTO MY ROLL NECKS A LOT THIS PAST WINTER, AND I DO LIKE A ROLL NECK LAYERED UNDER DRESSES OR OTHER TOPS LIKE THIS BURGUNDY ASYMMETRICAL TUNIC. So do add all your outfits – especially anything patterned – to this week’s iwillwearwhatilike link up! 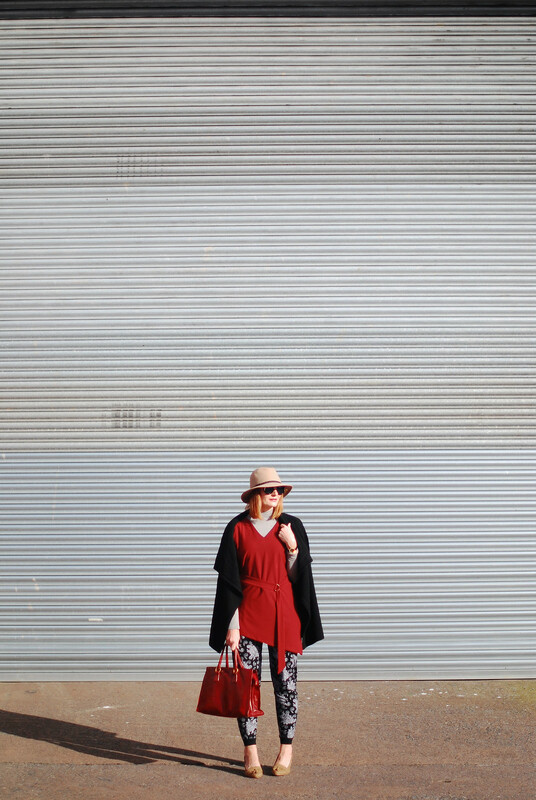 WHAT PATTERNS ARE ROCKING YOUR WORLD AT THE MOMENT – AND HAVE YOU STARTED WITH STRIPES AND/OR FLORALS FOR SPRING YET? COMMENT BELOW, OR TAKE IT TO TWITTER @NOTLAMB! 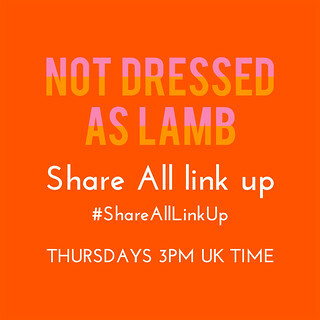 To get yourself featured next week make sure you’ve included a link back to Not Dressed As Lamb or my button in your post/sidebar – and link up something following this week’s theme! P.S. 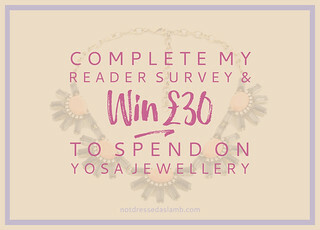 Last call: If you haven’t already please take part in my reader survey – it’ll only take 5 minutes and you could win a yosa.co.uk £30 prize draw as a thank you! 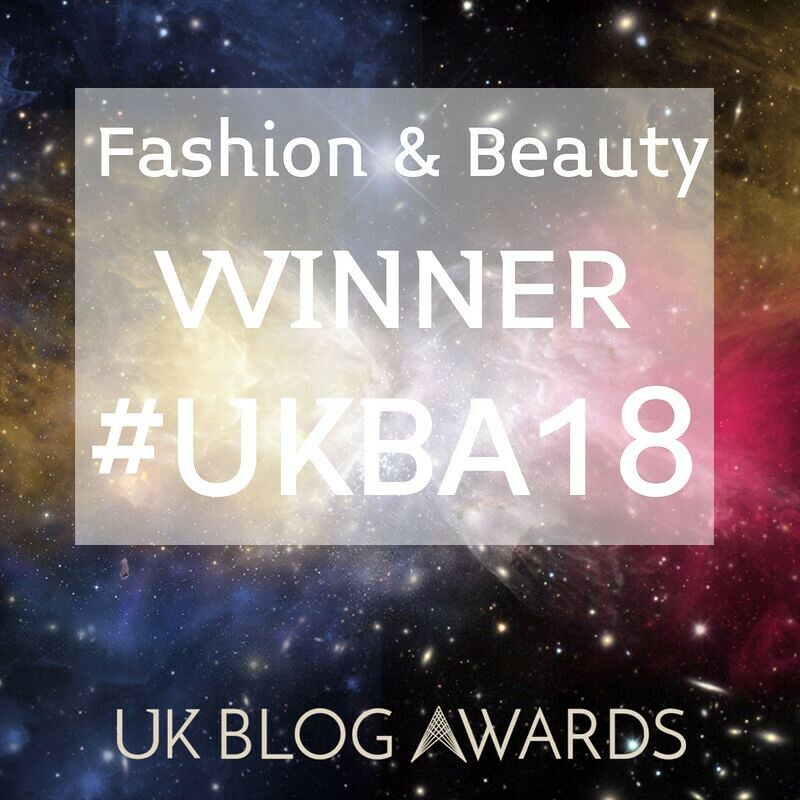 The aim is to improve the blog and give you more of what you want and less of what you don’t – thank you so much! 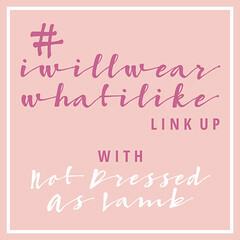 Thanks so much for supporting the My Refined Style link up! I know I already commented on this post, but I wanted to say thanks SO much for coming to the Fun Fashion Friday party & hope your weekend is wonderful! Very nice outfit. I really like the top. Yes… the trousers too, but the top best. And the hat. Of course. What a gorgeous red tone! I'd wear it in a heartbeat too. Lovely with the floral joggers! Thank you for the link-up, Catherine! Yes to red & grey! Fabulous colour combo Catherine & I can't tell you how much I adore your hat. I'd love to see it again with a different outfit, blimey come to think of it you could wear this hat with anything! Anna that is SO lovely to hear – thank you!!!!! I am thinking of creating a blogging e-course, so watch this space…!! Those joggers are great and love how you styled them! You know that I love those paisley joggers! And the asymmetrical line of the tunic makes for a totally cool pairing. Well done! The asymmetrical hemline of the tunic looks great – I love visual detail like this. To be totally honest I'm not sure about the joggers – and this is coming from a lass who loves print and pattern – maybe because they're joggers and not trousers? Weird, huh? Anyway, ignore me, just personal taste. However, the shoes are just so retro, I could kiss them. I swear I had a pair just like them when I was 18 – the little tassel and the heel! Ah, happy days. Totally love red on you! Looking fabulous,and beautiful photos as usual. Love the patterned joggers. I think it is such a current and stylish idea to dress up a jogger pant. Well done Catherine!! Wow. 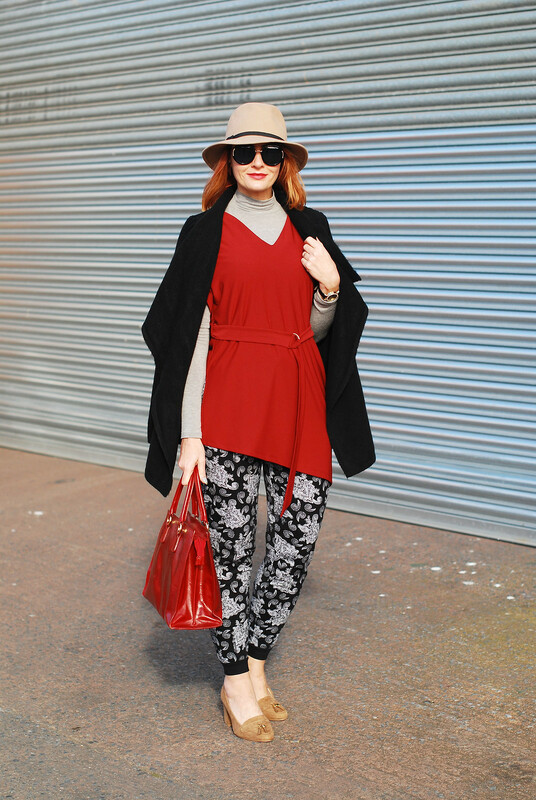 I love this rich red on you, and with the patterned pants in black and white, looks great! 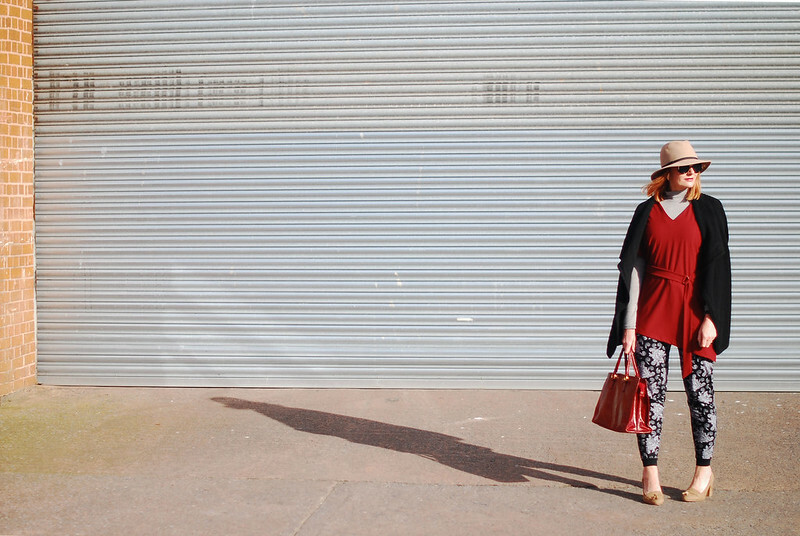 The asymetric tunic looks lovely and a versatile piece. Love that you layered it too. The red handbag is classic too! That shade of red looks fantastic on you. The whole outfit is fabulous. The photos are great as well. That's a shade of red I can really go for. And you just POP against that fantastic backdrop. I'm still trying to improve my photography skills to this level – baby steps. Haha. 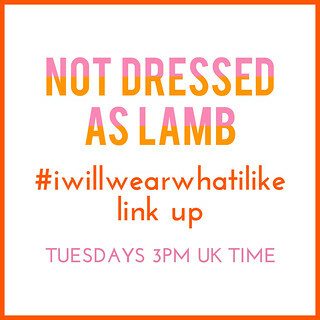 Thanks for the link-up this week and the ongoing theme of I WILL WEAR WHAT I LIKE. I can't get over how amazing you look here. This outfit is amazing. The layering of the tops is sheer genius. That red tunic style top is just gorgeous. I would never have thought that they were George at asda! Amazing! I love your red top! I love your patterned joggers! It's brought to my attention that I recently made several pairs of yoga pants, but none of them patterned. And me, loving all things floral, and dotty, and striped…so sad! Thank you for the light bulb moment and for reminding me that spring is really, very nearly upon us! Have a grand time in London. The exhibit sounds fascinating! Very nicely plaid, dear Catherine. I seem to be always out of step with the theme, trust me, lol. 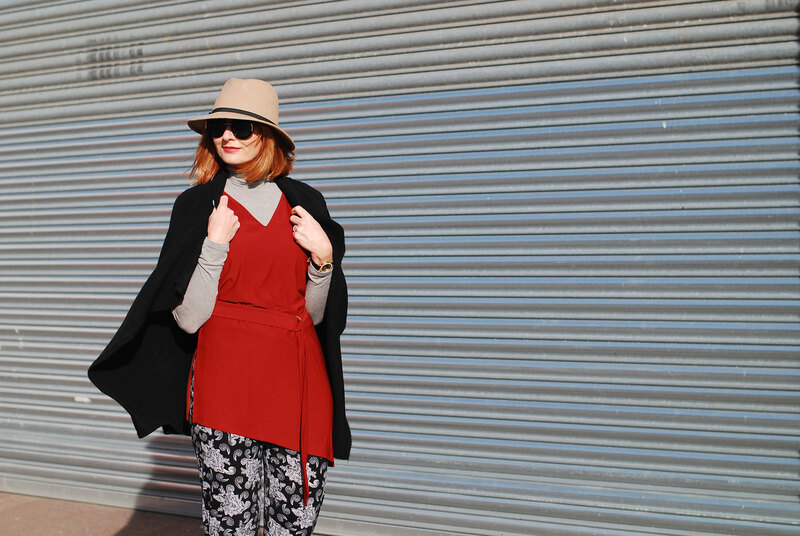 Roll necks are such a closet life-saver! I've been finding myself going back to them time and time again lately because they're so easy, so chic, and so WARM for winter. 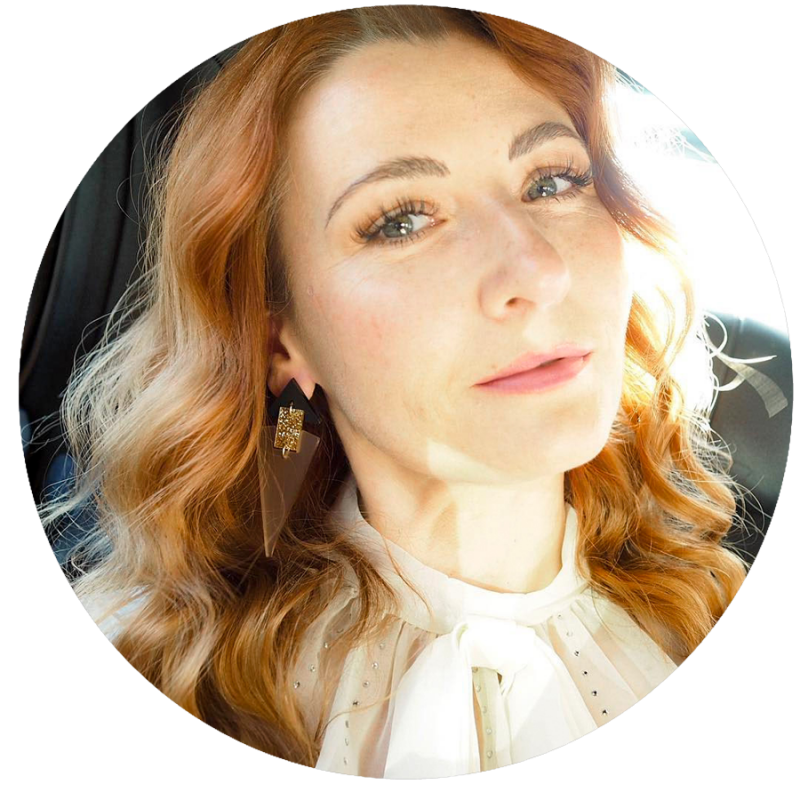 thanks Jodie – for me it's that cuffed hem that does it!! I saw the Vogue exhibition a week ago, I'm sure you will enjoy it, it's quite a visual feast. Great look! I love the asymmetrical tunic! And the paisley joggers are fun! Have fun in London!